in your and our friendship. I am honoured by the invitation of His Excellency Ambassador Piotr Nowin-Konopak to actively participate in the remembrance of the historic pastoral letter that the Polish Bishops had addressed to the German Bishops and their response to the Polish Bishops fifty years ago. This pastoral letter of the bishops evokes in each and every man a sense of good will for peace and friendship. 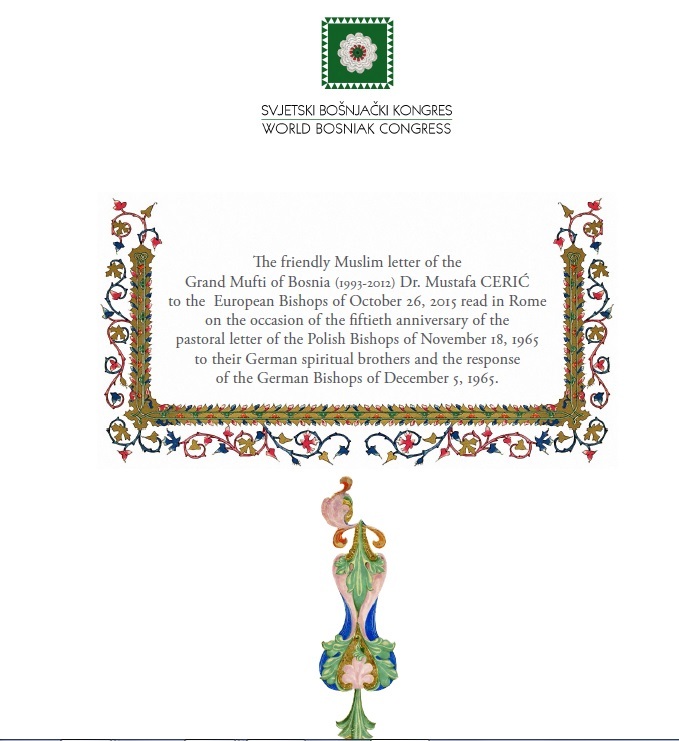 Indeed, this letter awakens a sincere desire for reconciliation among brothers. Rome is the right place for this historical memory. But, this is not only the right place. 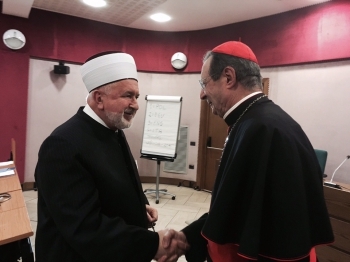 This is also the right time for an incentive to all people of good heart in the world to learn a lesson and accept the message of this pastoral letter: the lesson is that the heart of love is better than the heart of hate; and the message is that the hand of good healer is better than the hand of evil killer. 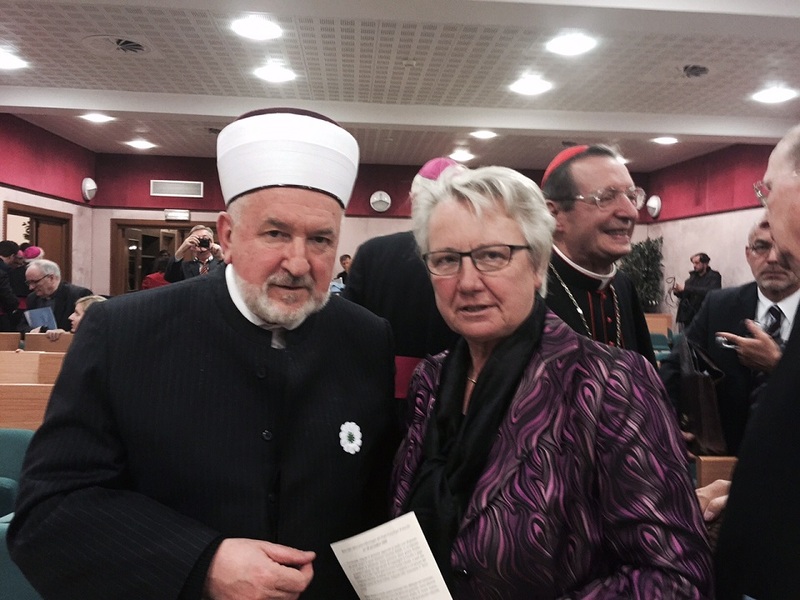 Inspired by the example of your fraternal and pastoral love in Europe, I felt the need and the freedom to write you, the European Bishops, this letter on behalf of my faith Islam, my Bosniak culture and the historical experience of my homeland Bosnia. This letter is an expression of friendship. As you know, the first murder was fratricidal. Cain killed his brother Abel. Jesus, the son of Mary, peace be upon him, was accepted and followed by his friends, his disciples, the apostles, Al-Hawariyyun. They were not his relative brothers. They were his friends in love. Thus, the love of friends can be even stronger than the love of brothers by blood. The first Muslims in Mecca were persecuted by their brothers. In order to save themselves from their brothers, they found refuge in the Christian friend, the king of Abyssinia, Negus. Thus, the king Negus has become a historic symbol of friendship between Muslims and Christians. Perhaps, here lies the primordial wisdom of the Qur'anic guidance to the Muslims: - You will surely find the nearest of them in affection to (you) the believers who say: "We are Christians." That is because among them are priests and monks. And because they are not arrogant. (Qur'an, 5:82). This Qur'anic description of your pastoral modesty requires my acceptance of and respect for you as my friends. I am aware that there have been and there will be some who read the Qur'an with the intention of encouraging an enmity. I write to you on behalf of the majority of Muslims who read the Qur'an and they find there the reasons for friendship. You will understand, therefore, that for myself, there is no stronger motivation than the Qur'an to offer you my friendship, and to receive yours. You will also understand that it is my privilege, as one of genocide survivors in Bosnia, to address you with a message of friendship and to invite you to the common virtue of ethics of sharing. What is life but sharing? Our mistakes of the past we cannot change. But, we can influence that our future be better than our past in the spirit of the ethics of sharing as we are taught by the eternal word of God from Adam through Noah, Abraham, Moses, Jesus to Muhammad, peace be upon all of them. If it was possible in the past to build walls and hedge exclusive spaces such as Christendom and Islamdom, today this is no longer possible. Not only in Europe, but also anywhere in the world no one religion, no one culture, no one nation can be in isolation. All religions, cultures and nations of the world rely a priori on each other and therefore it is necessary that we know each other. This truth has been highlighted in the Holy Quran in this way: - O men! Behold, We have created you all out of a male and a female, and have made you into nations and tribes, so that you might come to know one another. Verily, the noblest of you in the sight of God is the one who is most deeply conscious of Him. Behold, God is all-knowing, all-aware. (49:13). Allow me to tell you that our Europe today is not on the margins of the centre of Jerusalem and the Holy Land nor is Europe the centre of the world today. Europe today is together with itself and the whole world. Indeed, Europe is in a specific relationship with the Islamic world: geographically, historically, culturally and economically. In fact, the European and Islamic civilizations are fused by a destiny like Siamese twins. Any attempt of their separation causes pain and suffering in both of these two civilizational circles. Therefore, we are all aware that a severe surgical separation of the European and Islamic civilizations, as in the case of Siamese twins, would lead to the instant death of both or one only. No one knows which one. 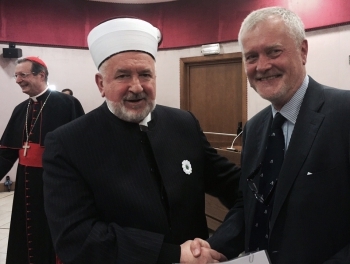 Because of this, the European and Islamic civilizations do not have the choice but to know and accept each other in the spirit of mutual friendship, based on the consciousness of the right of all men and women to life, religion, freedom, property and diglity. Thus I feel free to call you up that we don't close our European doors to those seeking refuge with us. I call that we don't build walls against those who come to us because their homes and homeland have been destroyed. Europe has survived all that the living human being could have survived: the endless divisions, long lasting wars, unbearable suffering, merciless persecution... But Europe rose from its ashes from Westphalia (1648) to Maastricht (1992) and showed the whole world that it is capable of peace and coexistence, that it is ready to adopt the ethics of sharing. Certainly, your letters from 1965 have greatly contributed to Europe being what it is today - a continent of peace, coexistence, social justice and prosperity for all people of good will. Therefore, it is inexplicable why at the end of the twentieth century on the territory of this Europe as it is, a genocide was allowed to happen against my people in Bosnia, the land with a thousand years of great human values which are the essence of today's Europe, the values of human good and dignity, human rights and freedoms, human peace and coexistence and the value of unity in diversity. 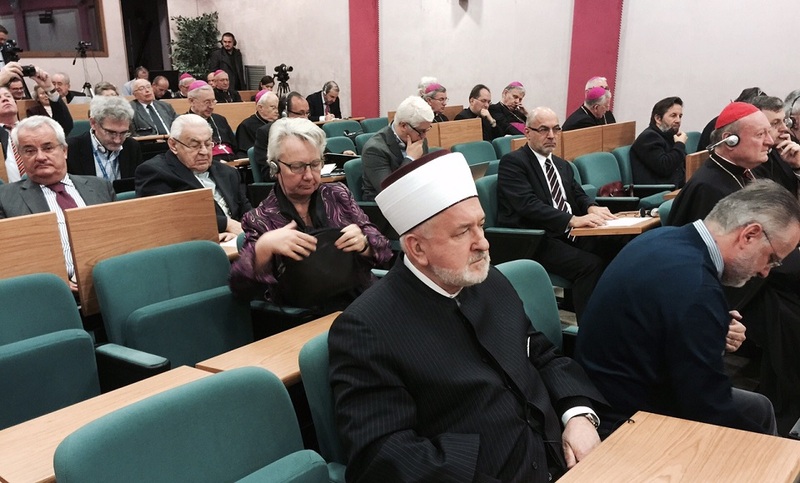 If Pope Francis said that the city of Sarajevo is the Jerusalem of Europe, then Europe has the right to be proud of its Sarajevo in the same way as the city of Sarajevo is proud to belong to an open and free Europe, where the cry of "Never Again" to Holocaust and Genocide must become embedded in the minds of all of us. Obviously, we are all in fear. You in Europe are in fear of a spreading fear of Islam. And we Muslims in Europe are in fear of those who spread the fear from us here and now. If anyone has it, it is Europe that has an experience of the false fears from those who are different. This is precisely what your letters are all about: the call to freedom from false fears of you yourselves and of the others who are different from you. 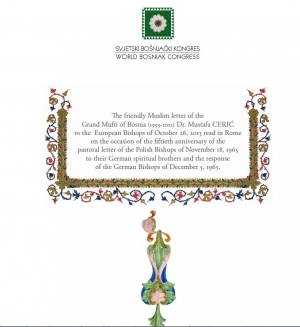 It is because of that that your letters have a historic importance not only for you as bishops, but also for all Europeans, who believe that truth, justice, peace and reconciliation are values of the first order. 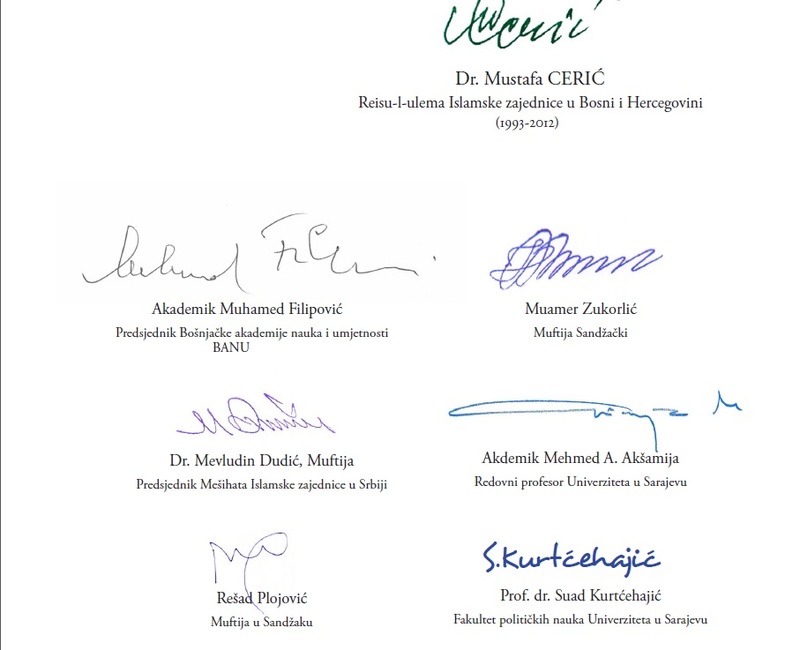 So, I hope that you will understand this letter, signed by prominent muftis, imams and Muslim intellectuals in Europe, as the voice of reason and knowledge that Adam and Eve are our common father and mother. It is not possible that we know everything about each other, but it is possible that we accept one another in the way as we present ourselves to each other without prejudice or fear. We accept you and we beg for your acceptance of us without prejudice or fear. It is not enough that we have an awareness of each other. It is necessary that we have a willingness to accept one another in a spirit of common good for all of us here and now in Europe, which has no reason to be afraid of anyone or anything, least of all Islam and Muslims, who in their names carry the meaning of the Peaceful Man. Dear God, if we forget Thee, Do not forget us! If we make a mistake, give us the strength the repentance of Adam! If we are darkened by false belief, enlighten us with the true faith of Ibrahim! If disaster befalls us, teach us how to build the Noah's Ark of salvation! If we are caught with the fear of tyrants, empower us with the justice of Moses! If we are offered hatred, save us with the love of Jesus! If we were expelled from our homes, strengthen us with Muhammad's desire to return to our homes! Dear God, may peace be upon all of the Prophets of God, Adam, Noah, Abraham, Moses Jesus and Muhammad! Your Eminences, in the hope that we will meet always in peace and understanding, please accept my sincere expressions of love and respect.